Your search returned 391 matches. abbreviana Fabricius, 1794 (Pyralis), Entomologia Systematica 3 (2): 278. TL: Denmark, Hafniae [Denmark].. Lectotype: ZMUC. unknown. excruciana Stephens, 1852 (Poecilochroma Epinotia )), List Specimens Br. Anim. Colln. Br. Mus 10: 35. TL: United Kingdom. Great Britain. Syntype(s): BMNH. unknown. lithoxylana Frolich, 1828 (Tortrix), Enum. Tortr. Wrtemberg : 233. TL: Germany. Wrtemburg. Syntype(s): Unknown. unknown. stannana Guenee, 1845 (Grapholitha ulmariana var. ), Annls Soc. ent. Fr. (2) 3: 171. TL: Europe. Syntype(s): MNHN. unknown. trimaculana Donovan,  (Phalaena), Nat. Hist. Br. Insects 11: 25. TL: United Kingdom. Great Britain. Syntype(s): BMNH. unknown. ulmariana "Duponchel, in Godart", 1842 (Grapholitha), Hist. nat. Lpid. Papillons Fr. (Suppl.) 4: 406. TL: France. Syntype(s): MNHN. unknown. ulmetana Lienig & Zeller, 1846 (Grapholitha), Isis von Oken (Leipzig) 1846 (3): 241. TL: Poland. Syntype(s): Unknown. unknown. uniformata Dufrane, 1957 (Eucosma trimaculana form), Bull. Inst. R. Sci. Nat. Belg. 33 (32): 8. TL: France. Holotype: IRSN. unknown. abnormana Kuznetzov, 1973 (Epinotia (Panoplia)), Ent. Obozr. 52: 683. TL: China, "Shansi Province, Mien-shan". Holotype: MGAB. male. absconditana Walker, 1863 (Sciaphila), List Specimens lepid. Insects Colln. Br. Mus 28:351. TL: Australia, "New South Wales, Sydney". Holotype: BMNH. female. aulacota Turner, 1946 (Bactra), Trans. R. Soc. S. Austral. 70: 212. TL: Australia. "New South Wales, Killarney, Acacia Plateau". Holotype: ANIC. male. perplexa Turner, 1916 (Eucosma), Trans. R. Soc. S. Austral. 40: 526. TL: Australia. "Queensland, Brisbane". Lectotype: ANIC. male. aciculana Falkovitsh, 1965 (Epinotia), Ent. Obozr. 44: 424. TL: Russia, "Far East, Primorsky Krai, Okeanskaya". Holotype: ZISP. male. albangulana Walsingham, 1879 (Paedisca), Illust. typical Specimens Lepid. Heterocera Colln. Br. Mus 4: 40. TL: USA, "California, Mendocino Co.". Holotype: BMNH. unknown. albicapitana Kearfott, 1907 (Proteopteryx), Trans. Am. ent. Soc. 33: 47. TL: USA, "California, Placer Co.". Lectotype: AMNH. male. albiguttata Oku, 1974 (Hikagehamakia), Konty 42: 15. TL: Japan, "Honshu, Akita Prefecture, Mt.Akita-komagatake". Holotype: EIHU. male. albimaculata Kuznetzov, 1976 (Epinotia), Trud. Inst. Zool. Leningrad 64: 23. TL: Russia. "Kuril Islands, Kunashir Island, Dubovoe". Holotype: ZISP. female. algeriensis "Chambon, in Chambon, Fabre & Khemeci", 1990 (Epinotia), Bull. (N.S.)Soc. ent. Fr. 95: 131. TL: Algeria, Algeria (fort de Babor). Holotype: INRA. male. anepenthes Razowski & Trematerra, 2010 (Epinotia), J. Entomol. Acarol. Res. (Ser. II) 42: 60. TL: Ethiopia, "Bale Mountains, Harenna Forest, Karcha Camp". Holotype: TREMC. male. aquila Kuznetzov, 1968 (Epinotia (Steganoptycha)), Ent. Obozr. 47: 567. TL: Russia, "Sakhalin, Korsakov". Holotype: ZISP. male. araea Diakonoff, 1983 (Epinotia), Zool. Verh. Leiden 204: 36. TL: Indonesia, "Sumatra, Mt. Bandahara, Bivouac Two". Holotype: NCB. female. arctostaphylana Kearfott, 1904 (Cydia), Can. Ent. 36: 109. TL: Canada, "British Columbia, Kaslo". Lectotype: AMNH. male. aridos Freeman, 1960 (Epinotia), Can. Ent. (Suppl. 16) 92: 30. TL: USA, "Montana, East Glacier". Holotype: CNC. male. atacta Diakonoff, 1992 (Epinotia), Annls Soc. ent. Fr. (N.S.) 28: 38. TL: Madagascar, "Central Madagascar (massif de l'Ankaratra, Manjaktompo)". Holotype: MNHN. female. autonoma Falkovitsh, 1965 (Epinotia), Ent. Obozr. 44: 428. TL: Russia, "Far East, Okeanskaya". Holotype: ZISP. female. tamaensis Kawabe, 1974 (Epinotia), Ty to Ga 25: 96. TL: Japan. "Honshu, Tokyo Prefecture, Tama Hill". Holotype: USNM. male. autumnalis Oku, 2005 (Epinotia), Tinea 18 (supplement 3): 110. TL: Japan, "Honshu, Iwate Prefecture, Mt. Sodeyama, Kuzumaki Town". Holotype: EIHU. male. balsameae Freeman, 1965 (Epinotia), J. Res. Lepid. 4: 219. TL: Canada, "Qubec, Aylmer". Holotype: CNC. male. biangulana Walsingham, 1879 (Steganoptycha), Illust. typical Specimens Lepid. Heterocera Colln. Br. Mus 4: 71. TL: USA, "Oregon, Crooked River.". Holotype: BMNH. unknown. bicolor Walsingham, 1900 (Pelatea), Ann. Mag. nat. Hist. (7)6: 335 TL: Japan/India, "Assam, Naga Hills". Syntypes: BMNH. "male, female". bicordana Heinrich, 1923 (Epinotia), Bull. U.S. natn. Mus. 123: 220. TL: Canada, "Manitoba, Aweme". Holotype: AMNH. male. bigemina Heinrich, 1923 (Epinotia), Bull. U.S. natn. Mus. 123: 220. TL: USA, "California, Carmel". Holotype: AMNH. male. bilunana Haworth, 1811 (Tortrix), Lepid. Br. (3): 436. TL: United Kingdom, Great Britain. Syntype(s): BMNH. unknown. cretaceana Frolich, 1828 (Tortrix), Enum. Tortr. Wrtemberg : 42. TL: Germany. Wrtemburg. Syntype(s): Unknown. unknown. ussuriensis Kuznetzov, 1970 (Epinotia bilunana ssp. ), Ent. Obozr. 49: 440. TL: Russia. "Primorsky Krai, near Ussuriysk". Holotype: ZISP. female. bispina Razowski & Wojtusiak, 2008 (Epinotia), Genus 19: 549. TL: Ecuador, "Province Pichincha, Crater Pululahua, West Cordillera". Holotype: MZUJ. female. biuncus Razowski & Wojtusiak, 2008 (Epinotia), Genus 19: 548. TL: Ecuador, "Province Carchi, Res. Forest Golondrinas, West Cordillera". Holotype: MZUJ. male. bricelus Diakonoff, 1992 (Epinotia), Annls Soc. ent. Fr. 28: 52. TL: Madagascar, "East Madagascar (Nord-Ouest de Fort-Dauphin, massif d'Ando-hahelo)". Holotype: MNHN. female. brunnichana Linnaeus, 1767 (Phalaena (Tortrix)), Systema Naturae (12th ed.) : 880. TL: Sweden, Syntype(s): Unknown. unknown. albodorsana Sheldon, 1935 (Eucosma brunnichana ab. ), Entomologist 68: 229. TL: United Kingdom. England [United Kingdom]. Holotype: BMNH. unknown. brunneana Sheldon, 1935 (Eucosma brunnichana ab. ), Entomologist 68: 229. TL: United Kingdom. England [United Kingdom]. Holotype: BMNH. unknown. brunneodorsana Sheldon, 1935 (Eucosma brunnichana ab. ), Entomologist 68: 229. TL: United Kingdom. England [United Kingdom]. Holotype: BMNH. unknown. ochreana Hauder, 1918 (Epiblema brunnichianum ab. ), Ent. Z.Frankf. a.M. 31: 102. TL: Austria. Linz. Syntype(s): SMFL. unknown. rectana Peyerimhoff, 1863 (Ephippiphora), Bull. Soc. Hist. Nat. Colmar 3 (1862): 126. TL: France. Alsace. Syntype(s): Unknown. unknown. sinuana [Denis & Schiffermuller], 1775 (Tortrix), Syst. Verz. Schmett. Wienergegend : 131. TL: Austria. Syntype(s): Unknown. unknown. bushiensis Kawabe, 1980 (Epinotia), Tinea 11: 22. TL: Japan, "Honshu, Saitama Prefecture, Iruma, Bushi". Holotype: USNM. male. canthonias Meyrick, 1920 (Acroclita), Exotic Microlepid. 2: 343. TL: India, "Bengal, Pusa". Holotype: BMNH. female. caprana Fabricius, 1798 (Pyralis), Suppl. Entomologiae Systematicae : 475. TL: Switzerland, Syntype(s): Unknown. unknown. brunneofasciana Sheldon, 1935 (Eucosma piceana ab. ), Entomologist 68: 230. TL: United Kingdom. England [United Kingdom]. Holotype: BMNH. unknown. divellana Hubner, [1832-1833] (Tortrix), Samml. Eur. Schmett. 7: pl. 53fig. 339. Syntype(s): Unknown. unknown. fuscana Sheldon, 1935 (Eucosma piceana ab. ), Entomologist 68: 230. TL: United Kingdom. England [United Kingdom]. Holotype: BMNH. unknown. fuscofasciana Sheldon, 1935 (Eucosma piceana ab. ), Entomologist 68: 231. TL: United Kingdom. England [United Kingdom]. Holotype: BMNH. unknown. fuscomaculana Sheldon, 1935 (Eucosma piceana ab. 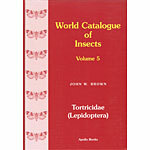 ), Entomologist 68: 231. TL: United Kingdom. England [United Kingdom]. Holotype: BMNH. unknown. griseana Sheldon, 1935 (Eucosma piceana ab. ), Entomologist 68: 230. TL: United Kingdom. England [United Kingdom]. Holotype: BMNH. unknown. melaleucana "Duponchel, in Godart", 1835 (Paedisca), Hist. nat. Lpid. Papillons Fr. 9: 375. TL: France. Syntype(s): MNHN. unknown. piceana Haworth, 1811 (Tortrix), Lepid. Br. (3): 440. TL: United Kingdom. Great Britain. Syntype(s): BMNH. unknown. semifuscana Stephens, 1834 (Poecilochroma (Epinotia)), Illust. Br. Ent. (Haustellata) 4: 140. TL: United Kingdom. Great Britain. Syntype(s): BMNH. unknown. vittana Westwood & Humphrey, 1845 (Poecilochroma), Brit. Moths Transf. 2: 147. TL: United Kingdom. Great Britain. Syntype(s): BMNH. unknown. caracae Razowski & Becker, 2014 (Epinotia), Polskie Pismo Entomol. 83: 25. TL: Brazil, "Minas Gerais, Caraca". Holotype: VBC. male. castaneana Walsingham, 1895 (Paedisca), Trans. ent. Soc. Lond. 1895: 511. TL: USA, "Colorado, Loveland". Holotype: BMNH. unknown. cedricida Diakonoff, 1969 (Epinotia (Evetria)), Annls Soc. ent. Fr. (N.S.) 5: 389. TL: France, "Depart Vaucluse, massif du Luberon". Holotype: MNHN. male. celtisana Riley, 1881 (Paedisca), Trans. St. Louis Acad. Sci 4: 319. TL: USA, Texas. Holotype: USNM. male. laracana Kearfott, 1907 (Proteopteryx), Trans. Am. ent. Soc. 33: 45. TL: USA. Ohio. Lectotype: AMNH. female. cercocarpana Dyar, 1903 (Eucosma), Proc. ent. Soc. Wash. 5: 297. TL: USA, "Colorado, Platte Canyon". Syntypes: AMNH: 1; USNM: 3 male. unknown. chalsocia Razowski & Becker, 2014 (Epinotia), Polskie Pismo Entomol. 83: 32. TL: Costa Rica, "Santa Cruz, Turrialba". Holotype: VBC. male. chloizans Razowski & Wojtusiak, 2006 (Epinotia), SHILAP Revta. Lepid. 34: 52. TL: Venezuela, "Cordillera de Mrida, Mrida, Monte Zerpa". Holotype: MZUJ. male. cineracea Nasu, (1991 (Epinotia), Appl. Ent. Zool. 26: 342. TL: Japan, "Hokkaido, Bibai". Holotype: OPU. male. cinereana Haworth, 1811 (Tortrix), Lepid. Br. (3): 451. TL: United Kingdom, Great Britain. Syntype(s): BMNH. unknown. criddleana Kearfott, 1907 (Proteopteryx), Can. Ent. 39: 58. TL: Canada. "Manitoba, Aweme". Lectotype: AMNH. male. petrana Hubner, [1811-1813] (Tortrix), Samml. Eur. Schmett. 7: pl. 33fig. 210. Syntype(s): Unknown. unknown. clasta Diakonoff, 1983 (Epinotia (Asthenia)), Zool. Verh. Leiden 204: 39 TL: Indonesia, "Sumatra, Mt. Bandahara, Bivouac Four". Holotype: NCB. female. columbia Kearfott, 1904 (Proteopteryx), Can. Ent. 36: 112. TL: Canada, "British Columbia, Wellington". Lectotype: AMNH. male. albidorsana Kearfott, 1904 (Proteopteryx columbia ssp. ), Can. Ent. 36: 113. TL: Canada. "British Columbia, Kaslo". Lectotype: AMNH. female. mediostriana Kearfott, 1904 (Proteopteryx columbia ssp. ), Can. Ent. 36: 114. TL: Canada. "British Columbia, Wellington". Lectotype: AMNH. male. contrariana Christoph, 1882 (Grapholitha), Bull. Soc. Imp. Nat. Moscou 56(4) (1881): 424. TL: Russia, "Primorsky Krai, Vladivostok". Syntypes: Unknown. unknown. corylana McDunnough, 1925 (Epinotia), Can. Ent. 57: 22. TL: Canada, "Ontario, Ottawa". Holotype: CNC. male. coryli Kuznetzov, 1970 (Epinotia), Ent. Obozr. 49: 437. TL: Russia, "Primorsky Krai, near Ussuriysk, mountain tayga station". Holotype: ZISP. female. crenana Hubner, [1814-1817] (Tortrix), Samml. Eur. Schmett. 7: pl. 38fig. 242. TL: Europe, Syntype(s): Unknown. unknown. castaneana Sheldon, 1929 (Epiblema crenana form), Entomologist 62: 241. TL: United Kingdom. England [United Kingdom]. Holotype: BMNH. unknown. fasciana Sheldon, 1929 (Epiblema crenana form), Entomologist 62: 242. TL: United Kingdom. England [United Kingdom]. Holotype: BMNH. unknown. fuscana Sheldon, 1929 (Epiblema crenana form), Entomologist 62: 242. TL: United Kingdom. England [United Kingdom]. Holotype: BMNH. unknown. marmorana Mansbridge, 1939 (Epiblema crenana ab. ), Entomologist 73: 287. TL: United Kingdom. Scotland [United Kingdom]. Holotype: Unknown. unknown. monachana Fischer von Roslerstamm, 1839 (Paedisca), Abbild. Berich. Ergnz Schmett.-Kunde 1: 139 TL: Germany. Syntype(s): Unknown. unknown. rufimaculana Mansbridge, 1939 (Epiblema crenana ab. ), Entomologist 73: 287. TL: United Kingdom. Scotland [United Kingdom]. Holotype: Unknown. unknown. cruciana Linnaeus, 1761 (Phalaena (Tortrix)), Fauna Svecica : 347. TL: Sweden, Syntype(s): Unknown. unknown. alaskae Heinrich, 1923 (Epinotia cruciana ssp. ), Bull. U.S. natn. Mus. 123: 229. TL: USA. "Alaska, Yukon". Holotype: USNM. male. alticolana Stephens, 1852 (Pamplusia), List Specimens Br. Anim. Colln. Br. Mus 10: 100. TL: United Kingdom. Great Britain. Syntype(s): BMNH. unknown. augustana Hubner, [1811-1813] (Tortrix), Samml. Eur. Schmett. "7: pl. 32, figs. 204,205." TL: Europe. Syntype(s): Unknown. unknown. brunneana Frolich, 1828 (Tortrix), Enum. Tortr. Wrtemberg : 75. TL: Germany. Wrtemburg. Syntype(s): Unknown. unknown. cockleana Kearfott, 1904 (Enarmonia), Can. Ent. 36: 137. TL: Canada. "British Columbia; Alberta, Banff; Manitoba, Aweme". Syntypes(2): AMNH; USNM. 2 males. direptana Walker, 1863 (Sciaphila), List Specimens lepid. Insects Colln. Br. Mus 28: 338. TL: Canada. "Hudson Bay, Albany River, St. Martin's Falls". Holotype: BMNH. female. excoecana Herrich-Schaffer, 1851 (Tortrix (Grapholitha)), Syst. Bearbeitung Schmett. Eur. 4: 272. TL: Germany. Syntype(s): Unknown. unknown. gradli Rebel, 1929 (Epinotia cruciana ab. ), Verh. zool.-bot. Ges. Wien 79: 49. TL: Austria. Holotype: Unknown. unknown. gyllenhahliana Thunberg & Borgstrm, 1784 (Tortrix), D. D. Dissert. Ent. Sist. Ins. Svecica 1: 22. TL: Sweden. Syntype(s): Unknown. unknown. lepida Heinrich, 1924 (Epinotia cruciana ssp. ), J. Wash. Acad. Sci. 14: 391. TL: USA. "New Hampshire, Coos Co., Mount Washington". Holotype: USNM. male. vilisana Walker, 1863 (Sciaphila), List Specimens lepid. Insects Colln. Br. Mus 28: 338. TL: Canada. "Hudson Bay, Albany River, St. Martin's Falls". Holotype: BMNH. female. viminana Guenee, 1845 (Hypermecia), Annls Soc. ent. Fr. (2) 3: 173. TL: France. Syntype(s): MNHN. unknown. dalmatana Rebel, 1891 (Grapholitha Paedisca), Verh. zool.-bot. Ges. Wien 41: 620. TL: Croatia, Croatia (Spalato). Lectotype: NHMV. male. mesopotamica Obraztsov, 1952 (Epinotia (Epinotia)), Z. Wien. ent. Ges. 37: 127. TL: Mesopotamia. Mesopotamia. Holotype: ZSM. male. obraztsovi Agenjo, 1967 (Epinotia), Eos 42 (1966): 287. TL: Spain. Almeria. Holotype: MNCNM. male. psychrodora Meyrick, 1936 (Phtheochroa), Exotic Microlepid. 5: 23. TL: Syria. Bludan. Holotype: BMNH. male. demarniana Fischer von Roslerstamm, 1839 (Paedisca), Abbild. Berich. Ergnz Schmett.-Kunde 1: 186 TL: Germany, Dresden. Syntype(s): Unknown. unknown. densiuncaria Kuznetzov, 1985 (Epinotia), Vestnik Zool. 1985 (1): 6. TL: Russia, "Far East, southern Primorsky Krai". Holotype: ZISP. male. deruptana Kennel, 1901 (Epiblema), Dt. ent. Z. Iris (1900) 13: 290. TL: Russia, "Anitaurus, Hadjin". Holotype: MNHU. male. digitana Heinrich, 1923 (Epinotia), Bull. U.S. natn. Mus. 123: 215. TL: Canada, "British Columbia, Kaslo". Holotype: USNM. male. dorsifraga Diakonoff, 1970 (Epinotia), Mm. O.R.S.T.O.M. 37: 136. TL: Madagascar, "Madagascar (Tsaratanana Range, Matsabory en dessous de l'Andohanisambirano)". Holotype: MNHN. female. emarginana Walsingham, 1879 (Proteopteryx), Illust. typical Specimens Lepid. Heterocera Colln. Br. Mus 4: 68. TL: USA, "California, Mendocino Co.". Lectotype: BMNH. unknown. ethnica Heinrich, 1923 (Epinotia), Bull. U.S. natn. Mus. 123: 201. TL: USA, "California, San Diego Co., San Diego". Holotype: USNM. male. evidens Kuznetzov, 1971 (Epinotia), Ent. Obozr. 50: 433. TL: China, "North Yunnan Province, Likiang". Holotype: MGAB. male. exquisitana Christoph, 1882 (Steganoptycha), Bull. Soc. Imp. Nat. Moscou 56(4) (1881): 428. TL: Russia, "Primorsky Krai, Vladi-vostok". Syntype(s): Unknown. unknown. pica Walsingham, 1900 (Eucosma), Ann. Mag. nat. Hist. (7)6: 337 TL: Japan. "Honshu, Kanagawa Prefecture, Yoko-hama". Syntypes: BMNH. "male, female". festivana Hubner, [1796-1799] (Tortrix), Samml. Eur. Schmett. "7: pl. 9, fig. 52." TL: Europe, Syntype(s): Unknown. unknown. fraternana Haworth, 1811 (Tortrix), Lepid. Br. (3): 449. TL: United Kingdom, Great Britain. Syntype(s): BMNH. unknown. concretana Peyerimhoff, 1863 (Ephippiphora), Bull. Soc. Hist. Nat. Colmar 3 (1862): 132. TL: France. Alsace. Syntype(s): Unknown. unknown. distinctana Wilkinson, 1859 (Coccyx), Brit. Tortrices : 111. TL: United Kingdom. Great Britain. Syntypes: ZDUG. "male, female". proximana Herrich-Schaffer, 1851 (Tortrix (Coccyx)), Syst. Bearbeitung Schmett. Eur. 4: 219. TL: Germany. Syntype(s): Unknown. unknown. fujisawai Kawabe, 1993 (Epinotia), Tinea 13: 237. TL: Taiwan, "Nantou Hsien, Lushan spa". Holotype: USNM. male. fumoviridana Heinrich, 1923 (Epinotia), Bull. U.S. natn. Mus. 123: 208. TL: USA, "California, Siskiyou Co., Shasta Retreat". Holotype: USNM. male. gimmerthaliana Lienig & Zeller, 1846 (Grapholitha), Isis von Oken (Leipzig) 1846 (3): 247. TL: Latvia, [Latvia]. Syntype(s): Unknown. unknown. granitana Herrich-Schaffer, 1851 (Tortrix (Steganoptycha)), Syst. Bearbeitung Schmett. Eur. 4: 280. TL: Czech Republic/Germany., Syntype(s): Unknown. unknown. griseiblema Razowski & Becker, 2014 (Epinotia), Polskie Pismo Entomol. 83: 25. TL: Mexico, "Distrito Federal, Mexico". Holotype: VBC. male. hamptonana Kearfott, 1875 (Eucosma), Can. Ent. 39: 153. TL: USA, "New Hampshire, Hampton". Lectotype: AMNH. male. hesperidana Kennel, 1921 (Epiblema), Palaear. Tortr. : 609. TL: Mauritania, Holotype: MNHU. unknown. heucherana Heinrich, 1923 (Epinotia), Bull. U.S. natn. Mus. 123: 217. TL: USA, "Virginia, Rosslyn". Holotype: USNM. male. hopkinsana Kearfott, 1907 (Eucosma), Trans. Am. ent. Soc. 33: 36. TL: USA, "Washington, Hoquiam". Lectotype: AMNH. male. cupressi Heinrich, 1923 (Epinotia hopkinsana ssp. ), Bull. U.S. natn. Mus. 123: 207. TL: USA. "California, Cypress Point". Holotype: USNM. male. huatuscana Razowski & Becker, 2014 (Epinotia), Polskie Pismo Entomol. 83: 30. TL: Mexico, "Veracruz, Huatusco". Holotype: VBC. male. huroniensis Brown, 1980 (Epinotia), Proc. ent. Soc. Wash. 82: 504. TL: Canada, "Qubec, Norway Bay". Holotype: CNC. male. hypsidryas Meyrick, 1925 (Eucosma), Exotic Microlepid. 3: 140. TL: India, "U.P., Deoban, Chakrata Div.". Lectotype: BMNH. male. immaculata Peiu & Nemes, 1968 (Epinotia (Panoplia)), Rev. Roum. Biol. Zool. 13: 342. TL: Romania, "Suceava, Fundu Moldovei". Holotype: TMB. male. immundana Fischer von Roslerstamm, 1839 (Paedisca), Abbild. Berich. Ergnz Schmett.-Kunde 1: 138 TL: Germany, Syntype(s): Unknown. unknown. estreyerana Guenee, 1845 (Phlaeodes), Annls Soc. ent. Fr. (2) 3: 173. TL: France. Syntype(s): MNHN. unknown. ignalinonis Strand, 1917 (Epiblema immundana ssp. ), Ent. Mitt. 6: 307. TL: Spain. Syntype(s): DEIB. unknown. improvisana Heinrich, 1923 (Epinotia), Bull. U.S. natn. Mus. 123: 269. TL: USA, California. Holotype: USNM. male. infessana Walsingham, 1900 (Thiodia), Ann. Mag. nat. Hist. (7)6: 404 TL: Syria, "Haleb, Shar Devsky". Syntypes: BMNH. "male, female". conturbatana Caradja, 1916 (Semasia), Dt. ent. Z. Iris 30: 63. TL: Russia. Amur. Syntypes: Unknown. unknown. infuscana Walsingham, 1879 (Semasia), Illust. typical Specimens Lepid. Heterocera Colln. Br. Mus 4: 62. TL: USA, "California, San Francisco". Holotype: BMNH. unknown. javierana Razowski & Pelz, 2007 (Epinotia), Polskie Pismo Entomol. 76: 14. TL: Argentina, "Tucuman, San Javier". Holotype: SMFL. male. johnsonana Kearfott, 1907 (Eucosma), Trans. Am. ent. Soc. 33: 36. TL: USA, Nevada. Lectotype: AMNH. female. kasloana McDunnough, 1925 (Epinotia), Can. Ent. 57: 23. TL: Canada, "British Columbia, Kaslo". Holotype: CNC. male. keiferana Lange, 1937 (Epinotia), Pan-Pacif. Ent. 13: 118. TL: USA, "California, San Francisco". Holotype: CAS. male. ketamana Amsel, 1956 (Steganoptycha (Epiblema)), Z. Wien. ent. Ges. 41: 23. TL: Morocco, Ketama. Holotype: LNK. male. kochiana Herrich-Schaffer, 1851 (Tortrix (Grapholitha)), Syst. Bearbeitung Schmett. Eur. 4: 262. TL: Germany, Syntype(s): Unknown. unknown. lanceata Razowski, 1999 (Epinotia), Acta zool. cracov. 42: 333 TL: Ecuador, "Pichincha Province, 12 km NW Papallacta". Holotype: CMNH. male. latiloba Razowski & Trematerra, 2010 (Epinotia), J. Entomol. Acarol. Res. (Ser. II) 42: 60. TL: Ethiopia, "Bale Mountains, Harenna Forest, Karcha Camp". Holotype: TREMC. male. lindana Fernald, 1892 (Steganopteryx), Can. Ent. 24: 178. TL: Canada, "Ontario, Hamilton". Lectotype: USNM. male. lomonana Kearfott, 1907 (Tortrix), Can. Ent. 39: 82. TL: Canada, "British Columbia, Victoria". Lectotype: AMNH. male. maculana Fabricius, 1775 (Pyralis), Systema Entomologiae : 647. TL: Sweden, Syntype(s): Unknown. unknown. ophtalmicana Hubner, [1796-1799] (Tortrix), Samml. Eur. Schmett. "7: pl. 9, fig. 51." Syntype(s): Unknown. unknown. madderana Kearfott, 1907 (Eucosma), Can. Ent. 39: 55. TL: Canada, "Manitoba, Rounthwaite". Lectotype: AMNH. male. majorana Caradja, 1916 (Gypsonoma incarnana var. ), Dt. ent. Z. Iris 30: 61. TL: Russia, "Far East, Khabarovsky Krai, Radd". Lectotype: MGAB. male. leucantha Meyrick, 1931 (Eucosma), Exotic Microlepid. 4: 145. TL: Japan. "Honshu, Tokyo Prefecture". Holotype: BMNH. female. medioplagata Walsingham, 1895 (Zeiraphera), Trans. ent. Soc. Lond. 1895: 516. TL: USA, "Colorado, Custer Co.". Holotype: BMNH. unknown. mediostria Razowski & Wojtusiak, 2010 (Epinotia), Acta Zool. Cracov. 53B: 126. TL: Peru, "Dept. Huanuco, via Huanuco-Tingo Maria, Carpish". Holotype: MZUJ. female. medioviridana Kearfott, 1908 (Eucosma), J. New York ent. Soc. 16: 168. TL: Canada, "Ontario, Ottawa". Lectotype: AMNH. male. melanosticta Wileman & Stringer, 1929 (Eucosma), Entomologist 62: 67. TL: Taiwan, Formosa [Taiwan] (Arizan). Holotype: BMNH. male. mercuriana Frolich, 1828 (Tortrix), Enum. Tortr. Wrtemberg : 73. TL: Germany, Wrtemburg. Syntype(s): Unknown. unknown. monticolana "Duponchel, in Godart", 1842 (Coccyx), Hist. nat. Lpid. Papillons Fr. (Suppl.) 4: 408. TL: France. Syntype(s): MNHN. unknown. meritana Heinrich, 1923 (Epinotia), Bull. U.S. natn. Mus. 123: 226. TL: USA, "Utah, Carbon Co.". Holotype: USNM. male. miscana Kearfott, 1907 (Eulia), Trans. Am. ent. Soc. 33: 91. TL: USA, "California, Placer Co., Cisco". Lectotype: AMNH. male. mniara Diakonoff, 1992 (Epinotia), Annls Soc. ent. Fr. (N.S.) 28: 53. TL: Madagascar, "East Madagascar (Piste d'Andapa a Ambalapaiso, 25 km E Andapa)". Holotype: MNHN. female. momonana Kearfott, 1907 (Proteopteryx), Can. Ent. 39: 125. TL: Canada, "Manitoba, Rounthwaite". Lectotype: AMNH. female. monticola Kawabe, 1993 (Epinotia), Tinea 13: 238. TL: Taiwan, "Hualien Hsien, Hohuanshan". Holotype: USNM. male. myricana McDunnough, 1933 (Epinotia), Entomologist 65: 206. TL: Canada, "Ontario, Bobcaygeon". Holotype: CNC. male. nanana Treitschke, 1835 (Coccyx), Schmett. Eur. 10 (3): 80. TL: Germany, Lectotype: TMB. male. domonana Kearfott, 1907 (Eucosma), Can. Ent. 39: 79. TL: USA. "Massachusetts, Middlesex Co., Framingham". Lectotype: AMNH. female. immetallana Peyerimhoff, 1863 (Ephippiphora), Bull. Soc. Hist. Nat. Colmar 3 (1862): 132. TL: France. Alscae. Syntype(s): Unknown. unknown. piceafoliana Kearfott, 1908 (Epinotia), J. New York ent. Soc. 16: 176. TL: USA. "New Jersey, Essex County Park". Lectotype: AMNH. female. waltavaarana Hoffmann, 1893 (Steganoptycha nanana var. ), Stettin. ent. Ztg. 54: 135. TL: Finland. Syntype(s): Unknown. unknown. nemorivaga Tengstrom, 1848 (Coccyx), Notis Sllsk. Fauna Flora Fenn. Frh 1: 88. TL: Finland, Syntype(s): ZMH. unknown. finitimana Doubleday, 1859 (Coccyx ? ), Synon. List Br. Butterflies Moths : 24. TL: United Kingdom. Great Britain. Syntype(s): BMNH. unknown. rhododendrana Herrich-Schaffer, 1851 (Tortrix (Steganoptycha)), Syst. Bearbeitung Schmett. Eur. 4: 281. TL: Austria. Alps. Syntype(s): Unknown. unknown. nigralbana Walsingham, 1879 (Paedisca), Illust. typical Specimens Lepid. Heterocera Colln. Br. Mus 4: 41. TL: USA, "California, Mendocino Co.". Syntypes: USNM; BMNH. male. nigralbanoidana McDunnough, 1929 (Epinotia), Can. Ent. 61: 271. TL: Canada, "Ontario, Pt. Pelee". Holotype: CNC. male. nigricana Herrich-Schaffer, 1851 (Tortrix (Coccyx)), Syst. Bearbeitung Schmett. Eur. 4: 220. TL: Germany/Austria, Syntype(s): Unknown. unknown. suasana Peyerimhoff, 1863 (Coccyx), Bull. Soc. Hist. Nat. Colmar 3 (1862): 133. TL: France. Syntype(s): Unknown. unknown. nigrovenata Razowski & Pelz, 2010 (Epinotia), SHILAP Revta. Lepid. 38: 24. TL: Chile, "Maule, Cauquenes Province, R.N. Fred. Albert". Holotype: SMFL. female. nisella Clerck, 1759 (Phalaena), Icones Insectorum Rariorum "1: pl. 12, fig. 6." TL: Sweden, probably Sweden. Syntype(s): Unknown. unknown. albodecorana Krulikowsky, 1908 (Epiblema nisella ab. ), Societas Ent. 23: 18. TL: Russia. Syntype(s): Unknown. unknown. anana Schrank, 1802 (Tortrix), Fauna Boica 2 (2): 72. TL: Europe. Syntype(s): Unknown. unknown. boeberana Fabricius, 1787 (Pyralis), Mantissa Insectorum 2: 239. TL: Europe. Syntype(s): Unknown. unknown. brunneana Dufrane, 1930 (Eucosma nisella ab. ), Lambillionea 30: 161. TL: Belgium. Baudour. Holotype: IRSN. female. cuspidana Haworth, 1811 (Tortrix), Lepid. Br. (3): 451. TL: United Kingdom. Great Britain. Syntype(s): BMNH. unknown. decorana Hubner, [1818-1819] (Tortrix), Samml. Eur. Schmett. 7: pl. 42fig. 265. Syntype(s): Unknown. unknown. fulminana Krulikowsky, 1908 (Epiblema nisella ab. ), Societas Ent. 23: 18. TL: Russia. Syntype(s): Unknown. unknown. lepidana Frolich, 1828 (Tortrix), Enum. Tortr. Wrtemberg : 94. TL: Germany. Wrtemburg. Syntype(s): Unknown. unknown. nisana Guenee, 1845 (Grapholitha), Annls Soc. ent. Fr. 2(3): 171. TL: France. Syntype(s): MNHN. unknown. pavonana Donovan,  (Phalaena), Nat. Hist. Br. Insects "2: pl. 58, fig. 3." TL: United Kingdom. England [United Kingdom]. Syntype(s): BMNH. unknown. rhombifasciana Haworth, 1811 (Tortrix ? ), Lepid. Br. (3): 451. TL: United Kingdom. Great Britain. Syntype(s): BMNH. unknown. rubiana Haworth, 1811 (Tortrix), Lepid. Br. (3): 450. TL: United Kingdom. Great Britain. Syntype(s): BMNH. unknown. siliceana Hubner, [1811-1813] (Tortrix), Samml. Eur. Schmett. 7: pl. 31fig. 196. Syntype(s): Unknown. unknown. stictana Haworth, 1811 (Tortrix ? ), Lepid. Br. (3): 451. TL: United Kingdom. Great Britain. Syntype(s): BMNH. unknown. niveipalpa Razowski, 2009 (Epinotia), SHILAP Revta. Lepid. 37: 129. TL: Vietnam, "Kon Tum, Dac Glei". Holotype: MNHU. female. nonana Kearfott, 1907 (Eucosma), Trans. Am. ent. Soc. 33: 30. TL: USA, "Colorado, Pueblo". Holotype: AMNH. female. normanana Kearfott, 1907 (Epinotia), Can. Ent. 39: 156. TL: Canada, "Manitoba, Aweme". Lectotype: AMNH. male. notoceliana Kuznetzov, 1985 (Epinotia), Vestnik Zool. 1985 (1): 5. TL: Russia, "Far East, southern Primorsky Krai". Holotype: ZISP. male. parki Bae, 1997 (Epinotia), Insecta Koreana 14: 22. TL: Korea, "Kangwon Province, Chuncheon". Holotype: UIB. male. pentagonana Kennel, 1901 (Epiblema), Dt. ent. Z. Iris 13(1900): 289. TL: China, "Hadjin, Sutschan". Holotype: MNHU. female. maculosa Kuznetzov, 1966 (Epinotia (Steganoptycha)), Trud. Zool. Inst. Leningrad 37: 177. TL: Russia. "Far East, Primorsky Krai". Holotype: ZISP. female. phorminx Razowski & Becker, 2014 (Epinotia), Polskie Pismo Entomol. 83: 34. TL: Costa Rica, Volcan Turrialba. Holotype: VBC. male. phyloeorrhages Diakonoff, 1970 (Epinotia (Panoplia)), Mm. O.R.S.T.O.M. 37: 132. TL: Madagascar, "Madagascar (Tsaratanana Range, route d'Am-bositra a Ambohimanga du Sud, km 39)". Holotype: MNHN. male. piceae "Issiki, in Issiki & Mutuura", 1961 (Panoplia), Microlepid. Ins. Injurious Conif. Plts. Japan : 36. TL: Japan, "Honshu, Sinano [Nagano], Omekura". Holotype: USNM. male. brevivalva Kuznetzov, 1968 (Epinotia elatana ssp. ), Ent. Obozr. 47: 572. TL: Russia. "Kuril Islands, Shikotan Island, near Krabo-zavodsk". Holotype: ZISP. female. elatana Falkovitsh, 1965 (Epinotia), Ent. Obozr. 44: 426. TL: Russia. "Far East, Primorsky Krai, Okeanskaya". Holotype: ZISP. male. longivalva Kuznetzov, 1968 (Epinotia elatana ssp. ), Ent. Obozr. 47: 572. TL: Russia. "Kuril Islands, Iturup, foot of Berutarube Volcano". Holotype: ZISP. male. piceae Kuznetzov, 1968 (Epinotia (Steganoptycha)), Ent. Obozr. 47: 569. TL: Russia. "Kuril Islands, Kunashir Island, near Serno-vodsk". Holotype: ZISP. male. pinicola Kuznetzov, 1969 (Epinotia (Steganoptycha)), Ent. Obozr. 48: 368 TL: Russia, "Kuril Islands, Kunashir Island, Sernovodsk". Holotype: ZISP. male. borealis Kuznetzov, 1969 (Epinotia pinicola ssp. ), Ent. Obozr. 48: 370. TL: Russia. "Kuril Islands, Paramushir Island, SW Servero-Kuril'sk". Holotype: ZISP. male. plumbolineana Kearfott, 1907 (Epinotia), Trans. Am. ent. Soc. 33: 53. TL: Canada, "BritishColumbia, Wellington". Lectotype: AMNH. male. russata Heinrich, 1924 (Epinotia cruciana ssp. ), J. Wash. Acad. Sci. 14: 391. TL: Canada. "British Columbia, Victoria". Holotype: USNM. male. potosicola Razowski & Becker, 2014 (Epinotia), Polskie Pismo Entomol. 83: 26. TL: Mexico, "Nuevo Leon, Cerro Potosi". Holotype: VBC. male. prepuncus Razowski, 2016 (Epinotia), Polskie Pismo Entomol. 85: 208. TL: Fiji, Viti Levu Suva. Holotype: BMNH. male. pullata "Falkovitsh, in Danilevsky, Kuznetzov & Falkovitsh", 1962 (Semasia (Epinotia)), Trud. Inst. Zool. Alma Ata 18: 104. TL: Khazakhstan, Zailiyskiy Alatau. Holotype: ZISP. unknown. pulsatillana Dyar, 1903 (Eucosma), Proc. ent. Soc. Wash. 5: 297. TL: USA, "Colorado, foothills at Boulder and Golden". Syntypes(19): USNM. unknown. siskiyouensis Heinrich, 1923 (Epinotia pulsatillana ssp. ), Bull. U.S. natn. Mus. 123: 202. TL: USA. "California, Siskiyou Co., Shasta Retreat". Holotype: USNM. male. purpuriciliana Walsingham, 1879 (Steganoptycha), Illust. typical Specimens Lepid. Heterocera Colln. Br. Mus 4: 72. TL: USA, California. Holotype: BMNH. unknown. pusillana Peyerimhoff, 1863 (Grapholitha), Bull. Soc. Hist. Nat. Colmar 3 (1862): 127. TL: France, Colmar. Syntype(s): Unknown. unknown. pygmaeana Hubner, [1796-1799] (Tortrix), Samml. Eur. Schmett. 7: pl. 12fig. 69. TL: Europe, Syntype(s): Unknown. unknown. radicana Heinrich, 1923 (Griselda), Bull. U.S. natn. Mus. 123: 186. TL: Canada, British Columbia. Lectotype: USNM. male. ramella Linnaeus, 1758 (Phalaena (Tinea)), Systema Naturae (10th ed.) : 540. TL: Europe, Syntype(s): Unknown. unknown. costana "Duponchel, in Godart", 1836 (Grapholitha), Hist. nat. Lpid. Papillons Fr. 9: 510. TL: France. Syntype(s): MNHN. unknown. fimbriana Stephens, 1829 (Anchylopera), Syst. Cat. Br. Insects (2): 178. TL: United Kingdom. Great Britain. Syntype(s): BMNH. unknown. paykulliana Fabricius, 1787 (Tortrix), Mantissa Insectorum 2: 235. TL: Sweden. Syntype(s): Unknown. unknown. sesquilunana Haworth, 1811 (Tortrix), Lepid. Br. (3): 435. TL: United Kingdom. Great Britain. Syntype(s): BMNH. unknown. rasdolnyana Christoph, 1882 (Steganoptycha), Bull. Soc. Imp. Nat. Moscou 56(4) (1881): 427. TL: Russia, "Primorsky Krai, Vladi-vostok". Syntype(s): Unknown. unknown. rectiplicana Walsingham, 1879 (Paedisca), Illust. typical Specimens Lepid. Heterocera Colln. Br. Mus 4: 40. TL: USA, "California, Mendocino Co.". Holotype: BMNH. unknown. removana McDunnough, 1935 (Epinotia), Can. Ent. 67: 146. TL: Canada, "Alberta, Waterton Lakes". Holotype: CNC. male. rubiginosana Herrich-Schaffer, 1851 (Tortrix (Steganoptycha)), Syst. Bearbeitung Schmett. Eur. 4: 282. TL: Europe, Nixdorf (Nixdorf). Syntype(s): Unknown. unknown. bouchardana Wilkinson, 1859 (Poecilochroma), Brit. Tortrices : 186. TL: United Kingdom. Great Britain. Syntypes: ZDUG. "male, female". incognatana Peyerimhoff, 1863 (Retinia), Bull. Soc. Hist. Nat. Colmar 3 (1862): 134. TL: France. Syntype(s): Unknown. unknown. koraiensis Falkovitsh, 1965 (Epinotia rubiginosana ssp. ), Ent. Obozr. 44: 426. TL: Russia. "Far East, Primorsky Krai, Okeanskaya". Holotype: ZISP. female. rubricana Kuznetzov, 1968 (Epinotia (Steganoptycha)), Ent. Obozr. 47: 575. TL: Russia, "Primorsky Krai, near Vladivostok". Holotype: ZISP. female. ruidosana Heinrich, 1923 (Epinotia), Bull. U.S. natn. Mus. 123: 216. TL: USA, "New Mexico, Lincoln National Forest, Ruidosa Canyon". Holotype: USNM. male. runtunica Razowski & Wojtusiak, 2009 (Epinotia), Acta Zool. Cracov. 51B: 161. TL: Ecuador, "Prov. Tungurahua, Banos-Runtun". Holotype: MZUJ. male. sagittana McDunnough, 1925 (Epinotia), Can. Ent. 57: 22. TL: Canada, "British Columbia, Departure Bay Biological Station". Holotype: CNC. male. salicicolana Kuznetzov, 1968 (Epinotia), Ent. Obozr. 47: 577. TL: Russia, "Kuril Islands, Kunashir, near Sernovodsk". Holotype: ZISP. male. seorsa Heinrich, 1924 (Epinotia), J. Wash. Acad. Sci. 14: 392. TL: Canada, "British Columbia, Vavenby". Holotype: USNM. male. septemberana Kearfott, 1907 (Epinotia), Trans. Am. ent. Soc. 33: 51. TL: USA, "New Jersey, Essex County Park". Lectotype: AMNH. male. signatana Douglas, 1845 (Sericoris), Zoologist 3: 844. TL: United Kingdom, Great Britain. Syntype(s): BMNH. unknown. kroesmanniana Heinemann, 1863 (Grapholitha), Schmett. Deut. Schweiz 2: 147. TL: Germany. Syntype(s): Unknown. unknown. padana Lienig & Zeller, 1846 (Grapholitha), Isis von Oken (Leipzig) 1846 (3): 243. TL: Latvia/Lithuania. Livlandia/Kurlandia [Latvia/Lithuania]. Syntype(s): Unknown. unknown. signiferana Heinrich, 1923 (Epinotia), Bull. U.S. natn. Mus. 123: 232. TL: USA, "California, San Diego". Holotype: USNM. male. silvertoniensis Heinrich, 1923 (Epinotia), Bull. U.S. natn. Mus. 123: 214. TL: USA, "Color-ado, Silverton". Holotype: USNM. male. sinuncus Razowski & Becker, 2014 (Epinotia), Polskie Pismo Entomol. 83: 36. TL: Costa Rica, San Vito. Holotype: VBC. male. slovacica Pato ka & Jaro, 1991 (Epinotia), Acta Ent. Bohemoslov. 88: 215 TL: Slovakia, Slovakia Central (Zarnovica). Holotype: NMPR. male. solandriana Linnaeus, 1758 (Phalaena (Tortrix)), Systema Naturae (10th ed.) : 532. TL: Europe, Syntype(s): Unknown. unknown. albosinuana Grabe, 1944 (Epiblema solandriana form), Z. Wien. ent. Ges. 29: 60. TL: Germany. Syntype(s): Unknown. unknown. centrostriana Sheldon, 1935 (Eucosma solandriana form), Entomologist 68: 199. TL: United Kingdom. Great Britain. Holotype: BMNH. unknown. fuscosolandriana Grabe, 1944 (Epiblema solandriana form), Z. Wien. ent. Ges. 29: 60. TL: Germany. Syntype(s): Unknown. unknown. fuscotrapezana Grabe, 1944 (Epiblema solandriana form), Z. Wien. ent. Ges. 29: 60. TL: Germany. Syntype(s): Unknown. unknown. griseana Sheldon, 1935 (Eucosma solandriana form), Entomologist 68: 175. TL: United Kingdom. Great Britain. Holotype: BMNH. unknown. ochreotrapezana Grabe, 1944 (Epiblema solandriana form), Z. Wien. ent. Ges. 29: 60. TL: Germany. Syntype(s): Unknown. unknown. parmatana Hubner, [1814-1817] (Tortrix), Samml. Eur. Schmett. "7: pl. 40 figs. 253,254." TL: Europe. Syntype(s): Unknown. unknown. ratana Hubner, [1811-1813] (Tortrix), Samml. Eur. Schmett. 7: pl. 37fig. 236. Syntype(s): Unknown. unknown. rhenana Thunberg & Becklin, 1791 (Tortrix), D. D. Dissert. Ent. Sist. Ins. Svecica 23: 43. TL: Sweden. Syntype(s): Unknown. unknown. rufana Sheldon, 1935 (Eucosma solandriana form), Entomologist 68: 175. TL: United Kingdom. Great Britain. Holotype: BMNH. unknown. rufosinuana Grabe, 1944 (Epiblema solandriana form), Z. Wien. ent. Ges. 29: 60. TL: Germany. Syntype(s): Unknown. unknown. semilunana Frolich, 1828 (Tortrix), Enum. Tortr. Wrtemberg : 45. TL: Germany. Wrtemburg. Syntype(s): Unknown. unknown. semimaculana Hubner, 1793 (Phalaena (Tortrix)), Samml. auser. Vgel Schmett : 8. TL: Europe. Syntype(s): Unknown. unknown. trapezana Fabricius, 1787 (Pyralis), Mantissa Insectorum 2: 228. TL: Denmark. Denmark (Copen-hagen). Syntype(s): Unknown. unknown. variegata Sheldon, 1935 (Eucosma solandriana form), Entomologist 68: 197. TL: United Kingdom. Great Britain. Holotype: BMNH. unknown. variegatastriana Sheldon, 1935 (Eucosma solandriana form), Entomologist 68: 197. TL: United Kingdom. Great Britain. Holotype: BMNH. unknown. solicitana Walker, 1863 (Grapholita), List Specimens lepid. Insects Colln. Br. Mus 28: 387. TL: Canada, Nova Scotia. Holotype: BMNH. unknown. tephrinana Zeller, 1875 (Paedisca), Verh. zool.-bot. Ges. Wien 25: 308. TL: USA. Massachusetts or Maine. Holotype: BMNH. unknown. sordidana Hubner, [1823-1824] (Tortrix), Samml. Eur. Schmett. 7: pl. 47fig. 292. TL: Europe, Syntype(s): Unknown. unknown. stabilana Stephens, 1852 (Paedisca), List Specimens Br. Anim. Colln. Br. Mus 10: 100. TL: United Kingdom. Great Britain. Syntype(s): BMNH. unknown. sotipena Brown, 1987 (Epinotia), J. Lepid. Soc. 40 (1986): 341. TL: USA, "Maryland, Plummers Island". Holotype: USNM. female. sperana McDunnough, 1935 (Epinotia), Can. Ent. 67: 144. TL: Canada, "Labrador, Hopedale". Holotype: CNC. male. sticta Razowski & Becker, 2014 (Epinotia), Polskie Pismo Entomol. 83: 28. TL: Brazil, "Santa Catarina, Bom Jardin de Serra". Holotype: VBC. male. subocellana Donovan,  (Phalaena), Nat. Hist. Br. Insects 11: 59. TL: United Kingdom, Great Britain (Sussex). Syntype(s): BMNH. unknown. arctica Strand, 1901 (Paedica subocellana form), Nyt Mag. Naturvid. 39: 68. TL: Norway. Syntype(s): DEIB. unknown. subplicana Walsingham, 1879 (Paedisca), Illust. typical Specimens Lepid. Heterocera Colln. Br. Mus 4: 41. TL: USA, "California, Mendocino Co.". Holotype: BMNH. unknown. basipunctana Walsingham, 1879 (Paedisca), Illust. typical Specimens Lepid. Heterocera Colln. Br. Mus 4: 40. TL: USA. "California, Lower Lake". Syntypes: BMNH; USNM. female. subsequana Haworth, 1811 (Tortrix), Lepid. Br. (3): 448. TL: United Kingdom, Great Britain. Syntype(s): BMNH. unknown. abiegana "Duponchel, in Godart", 1842 (Grapholitha), Hist. nat. Lpid. Papillons Fr. (Suppl.) 4: 409. TL: France. Syntype(s): MNHN. unknown. subuculana Rebel, 1903 (Epiblema), Verh. zool.-bot. Ges. Wien 53: 92. TL: Austria, Hut-tensee. Lectotype: NHMV. male. subviridis Heinrich, 1929 (Epinotia), Proc. U.S. natn. Mus. 75: 15. TL: USA, "California, San Diego". Holotype: USNM. male. tedella Clerck, 1759 (Phalaena), Icones Insectorum Rariorum "1: pl. 10, fig. 13." TL: Sweden, Syntype(s): Unknown. unknown. cembrana Hubner,  1816 (Evetria), Verz. bekannter Schmett. : 379. TL: Europe. Syntype(s): Unknown. unknown. comitana [Denis & Schiffermuller], 1775 (Tortrix), Ank. Verz. Schmett. Wiener-gegend. : 131. TL: Europe. Syntype(s): Unknown. unknown. hercyniana Frolich, 1828 (Tortrix), Enum. Tortr. Wrtemberg : 63. TL: Germany. Wrtemburg. Syntype(s): Unknown. unknown. latreillana Fabricius, 1798 (Pyralis), Suppl. Entomologiae Systematicae : 479. TL: Europe. Syntype(s): Unknown. unknown. piceana Hubner, [1796-1799] (Tortrix), Samml. Eur. Schmett. 7: pl. 12fig. 72. Syntype(s): Unknown. unknown. tenerana [Denis & Schiffermuller], 1775 (Tortrix), Syst. Verz. Schmett. Wienergegend :129 TL: Austria, Syntype(s): Unknown. unknown. amurensis Kuznetzov, 1968 (Epinotia tenerana ssp. ), Ent. Obozr. 47: 574. TL: Russia. "Amur Region, Klimoutsy". Holotype: ZISP. female. aurantiana Strand, 1901 (Paedisca penkleriana form), Nyt Mag. Naturvid. 39: 68. TL: Norway. Syntype(s): DEIB. unknown. errana Guenee, 1845 (Mixodia), Annls Soc. ent. Fr. (2) 3: 160. TL: Russia. Syntype(s): MNHN. unknown. fasciatana Strand, 1901 (Paedisca penkleriana form), Nyt Mag. Naturvid. 39: 68. TL: Norway. Syntype(s): DEIB. unknown. kurilensis Kuznetzov, 1968 (Epinotia tenerana ssp. ), Ent. Obozr. 47: 575. TL: Russia. "Kuril Islands, Kunashir Island, near Sernovodsk". Holotype: ZISP. male. oblitana "Duponchel, in Godart", 1842 (Grapholitha), Hist. nat. Lpid. Papillons Fr. (Suppl.) 4: 156. TL: France. Syntype(s): MNHN. unknown. retusana Haworth, 1811 (Tortrix), Lepid. Br. (3): 453. TL: United Kingdom. England [United Kingdom]. Syntype(s): BMNH. unknown. roseolana Frolich, 1828 (Tortrix), Enum. Tortr. Wrtemberg : 91. TL: Germany. Wrtemburg. Syntype(s): Unknown. unknown. tergorana Frolich, 1828 (Tortrix), Enum. Tortr. Wrtemberg : 89. TL: Germany. Wrtemburg. Syntype(s): Unknown. unknown. unicolorana Schawerda, 1922 (Epiblema peukleriana [sic!] ab. ), Verh. zool.-bot. Ges. Wien 71: 167. TL: Bosnia. "Bosnia-Herzegovina, Sarajevo". Syntype(s): Unknown. unknown. ussurica Kuznetzov, 1968 (Epinotia tenerana ssp. ), Ent. Obozr. 47: 572. TL: Russia. "Primorsky Krai, near Vladivostok, Lyanchikhe River". Holotype: ZISP. male. terracoctana Walsingham, 1879 (Paedisca), Illust. typical Specimens Lepid. Heterocera Colln. Br. Mus (3) (1)4: 39. TL: USA, "California, Mount Shasta". Syntypes: MCZ: 1; BMNH; AMNH: 3. unknown. tetraquetrana Haworth, 1811 (Tortrix), Lepid. Br. (3): 454. TL: United Kingdom, Great Britain. Syntype(s): BMNH. unknown. angulana Haworth, 1811 (Tortrix), Lepid. Br. (3): 455. TL: United Kingdom. Great Britain. Syntype(s): BMNH. unknown. deficiens Dufrane, 1957 (Eucosma tetraquetrana form), Bull. Inst. R. Sci. Nat. Belg. 33 (32): 8. TL: Belgium. Holotype: IRSN. unknown. frutetana Hubner, [1823-1824] (Tortrix), Samml. Eur. Schmett. "7.: pl. 47 figs. 293,294." TL: Europe. Syntype(s): Unknown. unknown. hypoleucana Frolich, 1828 (Tortrix), Enum. Tortr. Wrtemberg : 96. TL: Germany. Wrtemburg. Syntype(s): Unknown. unknown. kurilensis Kuznetzov, 1969 (Epinotia (Steganoptycha) tetraquetrana ssp. ), Ent. Obozr. 48: 371. TL: Russia. "Kuril Islands, Kunashir Island, near Alekhino". Holotype: ZISP. male. ochreana Hauder, 1918 (Epiblema tetraquetranum ab. ), Ent. Z.Frankf. a.M. 31: 102. TL: Austria. Linz. Syntype(s): SMFL. unknown. opacana Hauder, 1918 (Epiblema tetraquetranum form), Ent. Z.Frankf. a.M. 31: 102. TL: Austria. Linz. Syntype(s): SMFL. unknown. rufa Dufrane, 1957 (Eucosma tetraquetrana form), Bull. Inst. R. Sci. Nat. Belg. 33 (32): 8. TL: Belgium. Holotype: IRSN. unknown. triquetrana Haworth, 1811 (Tortrix), Lepid. Br. (3): 454. TL: United Kingdom. Great Britain. Syntype(s): BMNH. unknown. umbratana Strand, 1901 (Paedisca tetraquetrana form), Nyt Mag. Naturvid. 39: 69. TL: Norway. Syntype(s): DEIB. unknown. thaiensis Kawabe, 1995 (Epinotia), Microlepid. Thailand 3: 54. TL: Thailand, "Loei Province, Phu Luang Wildlife Sanctuary". Holotype: OPU. male. thapsiana Zeller, 1847 (Penthina), Isis von Oken (Leipzig) 1847 (9): 654. TL: Italy, Syntype(s): Unknown. unknown. tianshanensis Liu & Nasu, 1993 (Epinotia), Ty to Ga 44: 60. TL: China, "Xinjiang Uygur Autonomous Region, Tian Mtns.". Holotype: ZISP. male. transmissana Walker, 1863 (Penthina), List Specimens lepid. Insects Colln. Br. Mus. 28: 375. TL: Canada, Nova Scotia. Holotype: BMNH. male. trigonella Linnaeus, 1758 (Phalaena (Tinea)), Systema Naturae (10th ed.) : 538. TL: Sweden, (probably Sweden). Syntype(s): Unknown. unknown. bimaculana Donovan,  (Phalaena), Nat. Hist. Br. Insects 13: 459. TL: United Kingdom. Great Britain. Syntype(s): BMNH. unknown. biscutana Wocke, 1862 (Grapholitha), Stettin. ent. Ztg. 23: 61. TL: Norway. Syntype(s): ZISP. unknown. dissimilana Treitschke, 1835 (Paedisca), Schmett. Eur. 10: 103. TL: Europe. Lectotype: TMB. male. indecorana Zetterstedt, 1839 (Teras), Insecta Lapponica Descripta : 989. TL: Norway. Lapponia. Lectotype: UZIL. male. petalonota Meyrick, 1937 (Eucosma), Exotic Microlepid. 5: 157. TL: Greenland. "West Greenland (Sondra, Stromfjord, Camp Lloyd)". Lectotype: OUM. unknown. similana Hubner, 1793 (Phalaena (Tortrix)), Samml. auser. Vgel Schmett. : 13. TL: Germany. Syntype(s): Unknown. unknown. stroemiana Fabricius, 1781 (Pyralis), Species Insectorum 2: 280. TL: Germany. Syntype(s): Unknown. unknown. trossulana Walsingham, 1879 (Grapholitha), Illust. typical Specimens Lepid. Heterocera Colln. Br. Mus 4: 67. TL: USA, "California, Siskiyou Co.". Holotype: BMNH. male. tsugana Freeman, 1967 (Epinotia), J. Res. Lepid. 5: 13. TL: Canada, "British Columbia, Vancouver Island, Holberg". Holotype: CNC. male. tsurugisana Oku, 2005 (Epinotia), Tinea 18 (supplement 3): 108. TL: Japan, "Shikoku, Tokushima Prefecture, Mt. Tsurugisan". Holotype: EIHU. male. ulmi Kuznetzov, 1966 (Epinotia (Panoplia)), Trud. Zool. Inst. Leningrad 37: 182. TL: Russia, "Primorsky Krai, Kangauz". Holotype: ZISP. male. ulmicola Kuznetzov, 1966 (Epinotia (Hamuligera)), Trud. Zool. Inst. Leningrad 37: 179. TL: Russia, "Far East, Primorsky Krai, Vladivostok". Holotype: ZISP. male. unisignana Kuznetzov, 1962 (Epinotia (Hamuligera)), Bull. ent. Soc. Mulhouse 1962: 53. TL: Russia, "Far East, Amur Region, Klimoutsy". Holotype: ZISP. unknown. vagana Heinrich, 1923 (Epinotia), Bull. U.S. natn. Mus. 123: 230. TL: USA, "Washington, Liaga". Holotype: USNM. male. vertumnana Zeller, 1875 (Paedisca), Verh. zool.-bot. Ges. Wien 25: 310. TL: USA, "Texas, Dallas". Lectotype: MCZ. female. vorana Strand, 1920 (Evetria), Ent. Mitt. 9: 30. TL: Russia, Kiautschou. Holotype: DEIB. female. walkerana Kearfott, 1907 (Eucosma), Trans. Am. ent. Soc. 33: 89. TL: USA, "Washington, District of Columbia". Lectotype: AMNH. female. xandana Kearfott, 1907 (Eucosma), Trans. Am. ent. Soc. 33: 24. TL: USA, "Ohio, Cincinnati". Lectotype: AMNH. male. yandana Kearfott, 1907 (Eucosma), Trans. Am. ent. Soc. 33: 25. TL: USA. "Pennsyl-vania, New Brighton". Lectotype: AMNH. male. xyloryctoides Diakonoff, 1992 (Epinotia), Annls Soc. ent. Fr. (N.S.) 28: 55. TL: Madagascar, "South Madagascar (Plateau Mahafaly, 11-12 km E Ankalirano)". Holotype: MNHN. female. yoshiyasui Kawabe, 1989 (Epinotia), Microlepid. Thailand 2: 55. TL: Thailand, "Chiang Mai, Doi Inthanon". Holotype: OPU. male. zamorata Razowski, 1999 (Epinotia), Acta zool. cracov. 42: 334 TL: Ecuador, "Zamora-Chinchipe Province, 36 km NW Zamora". Holotype: CMNH. male. zamorlojae Razowski & Wojtusiak, 2008 (Epinotia), Acta Zool. Cracov. 51B: 25. TL: Ecuador, "Province Zamora Chinchipe, Loja-Zamora, ""Arcoiris"" Estacion Cientifica". Holotype: MZUJ. female. zandana Kearfott, 1907 (Eucosma), Trans. Am. ent. Soc. 33: 25. TL: USA, "Ohio, Cincinnati". Lectotype: AMNH. male. atristriga Clarke, 1953 (Epinotia), J. Wash. Acad. Sci. 43: 228. TL: USA. "Illinois, Putnam Co.". Holotype: USNM. male.